About Tsukuba Dairy Products Co., Ltd | Tsukuba Dairy Products Co., Ltd.
We strive to be a food manufacturer that delivers inspiration, satisfaction and peace of mind to consumers. Our company began its operation as Moriyama Dairy Products Ishioka Factory in the December of 1941, and became independent as Tsukuba Dairy Products Co., Ltd in June 1951. In March of 1973, we joined the Shoei Foods Corporation group and began processing nuts in addition to producing dairy products in June of 2000. We strive to further advance nut-processing technology as well as the dairy-product production technology and the quality-control system that we have acquired since our establishment. We unremittingly pursue consumer peace of mind and safety to deliver inspiration, satisfaction and safety. 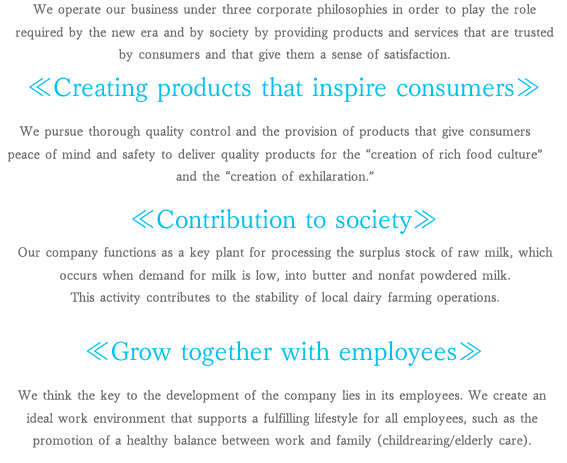 We make every effort to contribute to the development of the domestic dairy industry. We would appreciate your continuous understanding and support. We operate our business under three corporate philosophies in order to play the role required by the new era and by society by providing products and services that are trusted by consumers and that give them a sense of satisfaction. Our company functions as a key plant for processing the surplus stock of raw milk, which occurs when demand for milk is low, into butter and nonfat powdered milk.This activity contributes to the stability of local dairy farming operations. We think the key to the development of the company lies in its employees. We create an ideal work environment that supports a fulfilling lifestyle for all employees, such as the promotion of a healthy balance between work and family (childrearing/elderly care). Changed to dairy product manufacturing. Started manufacturing powdered milk, butter, condensed milk, other general dairy products, lactic beverage, and juices. 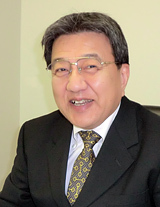 Ishioka Powdered Milk Plant established. Established a mixed-packaging plant for ice cream mix powder and powdered hot chocolate at the Tamari Plant. Established a powdered-milk production facility and a sequencing butter-making machine to increase production of powdered milk, butter and condensed milk at the Tamari Plant. Established LL plant inside the Tamari Plant. Established a small dryer facility at the Ishioka Plant. Tamari Plant Administrative Building constructed. Established a second dryer facility at the Tamari Plant. Upgraded concentrating machines at the Ishioka Plant. Upgraded aseptic filling machines at the LL plant. Acquired ISO9001 certification for all product categories. Upgraded aseptic filling facility at the LL plant. Established sales head office in Sotokanda, Chiyoda-ku, Tokyo. Show Tsukuba Dairy Products Co., Ltd-Corporate Headquarters/Ishioka Plant in larger map. Show Tsukuba Dairy Products Co., Ltd-Tamari Plant in larger map. Show Tsukuba Dairy Products Co., Ltd-Sales Head Office in larger map. Show Tsukuba Dairy Products Co., Ltd-Sendai Office in larger map. Show Tsukuba Dairy Products Co., Ltd-Osaka Office in larger map. Show Tsukuba Dairy Products Co., Ltd-Kyushu Branch Office in larger map.